I was on the wooded slopes of the Holywood hills during the week. 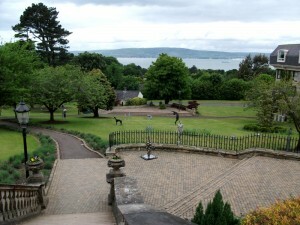 Our Holywood, with one ‘l’, overlooks Belfast Lough and across to the County Antrim coastline. For once, I was more interested in my immediate surroundings. 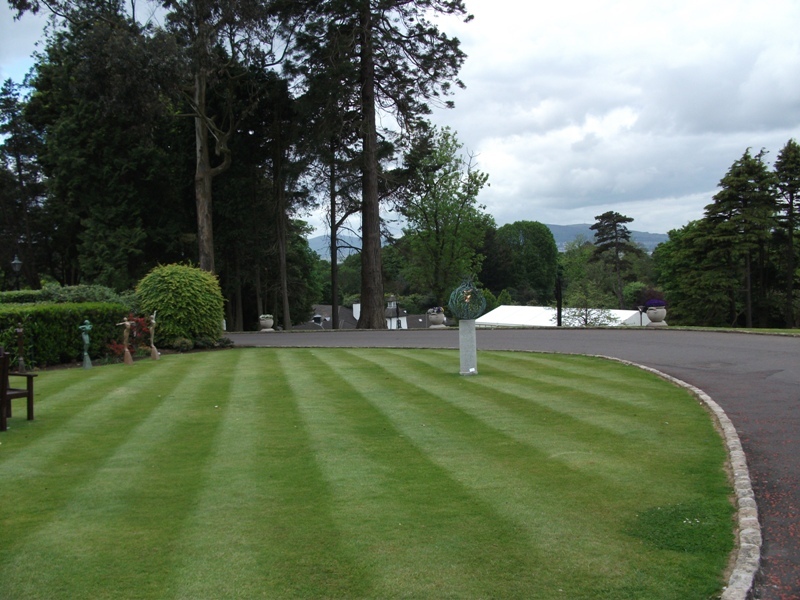 Originally, Culloden Estate was built as an official palace for the Bishops of Down, in 12 acres of beautiful secluded gardens and woodland and is only 6 miles from Belfast City Centre. Culloden Estate and Spa is now a 5 star hotel. 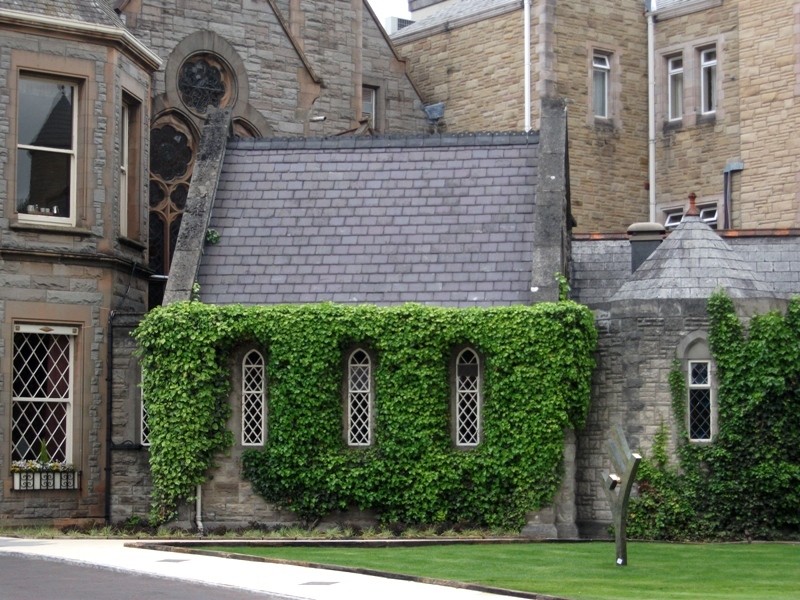 It was built in 1876 and took two and a half years to complete, and most of the stone came from Scotland by boat, arriving in the County Down fishing village of Portaferry and being brought to the site by horse and cart. Not sure I would like this guy outside my front door. 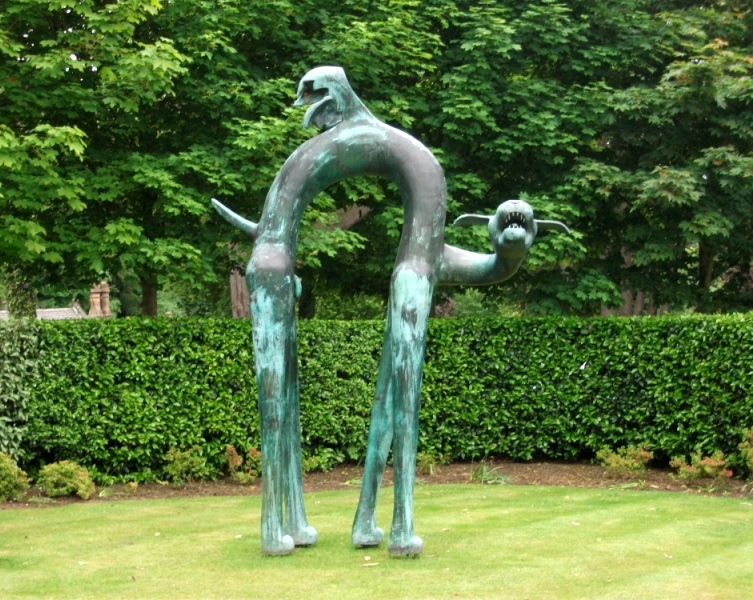 This bronze sculpture was the work of Barry Callaghan, it was commissioned by the Arts Council of Northern Ireland in 1992 and made available to Culloden Estate & Spa. I am hoping to have a few more lives left before I reach my ninth! In this life, my reason to visit was for ‘Art In The Garden‘, the first event of its kind in Northern Ireland. In association with the Culloden, Gormleys Fine Art were hosts of the event. A veritable feast of over 100 sculptures – some life size and others suitable for indoor display. Every corner you turned or every pathway you followed provided a veritable feast. 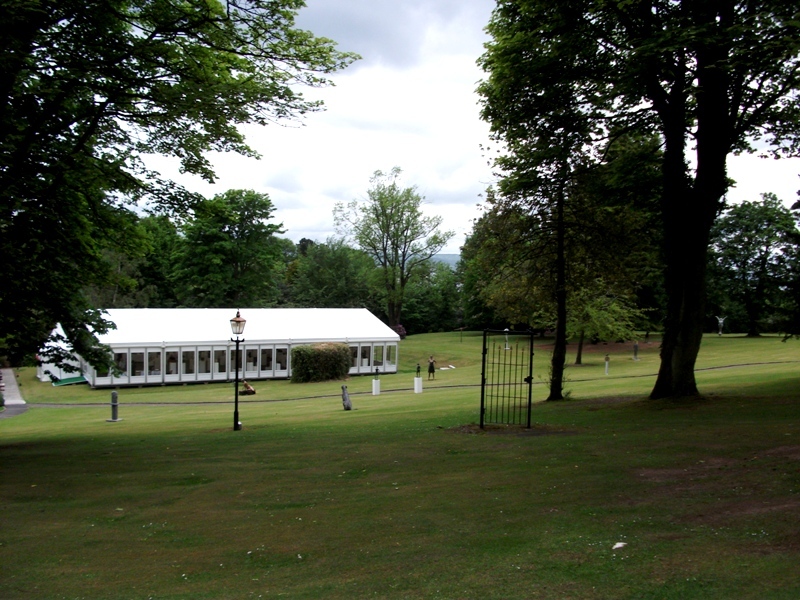 The marquee was the display area for the smaller items. Over the next few Sundays I will focus on some of the pieces. This entry was posted in Ireland, Photography, Sculpture on May 22, 2011 by Grannymar. Grannymar you are full of “life”. There is no stopping you. What a wonderful experience! I love art, and look forward to your upcoming posts. Every time we thought of going to see the sculptures, it started pouring with rain, so we never got there. It looks like you had to do a fair bit of walking to find them all. Thanks for this virtual treat! Nick – The way things were arranged, I didn’t realise that I had walked so far. It was very well presented and didn’t feel cluttered. I took plenty of photos and some I will reproduce over the coming weeks. WWW – I think you would have enjoyed it! I hadn’t heard about that at all- I look forward to seeing the photographs. If anything was needed to make NI the place on priority to visit, these photos did. They are lovely. Ramana – Thank you. This is only one small corner of our lovely land. It’s a beautiful estate. Think I agree with you though about that first sculpture. blackwatertown – Ninth Life seems to be a permanent item and not part of the event. What a lovely garden for art. I love the ivy-covered cottages!